Well, it is summer time and my garden, though small, is home to few delicious herbs. As I enjoy cooking with fresh herbs when I can, I tend to grow herbs that I will use. Just like the music, I enjoy parsley, sage, rosemary, and thyme. I have biennial parsley growing nicely next to the wooden fence. Biennial, means that it will grow for two years, rather than for one year that an annual will grow. At least until I discovered a few days ago 24 black swallowtail caterpillars eating them up. Apparently, a black swallowtail butterfly prefers to eat parsley, or any plant in the carrot family. I gave up any thoughts of using parsley this year, and actually rushed off to the supermarket to buy some fresh parsley, as they were just about finished eating all of mine. I had convinced most of these hungry caterpillars to enjoy the store bought parsley. However, just yesterday I noticed there were four less on my adopted parsley leaves. About ten feet away, on the other side of my patio I had recently planted a lovage (Levisticum officinale) plant. This was a plant species that I have not seen since I left my mother’s garden behind years ago. It is also known as love parsley or sea parsley. It has many culinary uses. The leaves and shoots can be cooked, or, as I enjoy, torn and added to salads. For herbalists, lovage has been used to treat indigestion and rheumatism, by drinking it as a tea. An interesting tidbit of information, is that the perfume industry has used the essence of lovage in fragrances. So, basically, I discovered that although the Butterfly House person said that the caterpillars tend to continue feeding on the same plant species, my adopted black swallowtail caterpillars were not choosy and were happy to continue eating on my lovage. Unfortunately for them, I picked them off my lovage, and placed them in my store bought parsley. 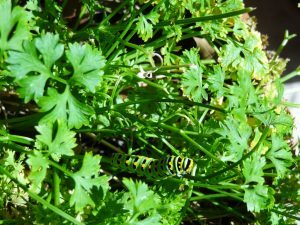 Now there are only eleven caterpillars left on my store bought parsley, but the four renegade caterpillars have disappeared. Although 3% get eaten by birds, I found that all of the 24 caterpillars made their way to the nearby wooden garden fence and were already changed into pupae. Another herb found growing in my garden is an apple mint. The mint family has many species. Mint plants are easy to identify by their scent, but also by their square stems. Grasses have round stems, sedges have triangular stems, and the mint family have square stems. Apple mint was a mint that I recalled from my childhood. Not as strong as spearmint, but has soft, velvety feeling leaves. Having my own plant allows me to have fresh mint for when I make tzaziki, a Greek dish made with cucumber, Greek yogurt, fresh mint, lots of finely chopped garlic, and touch of salt. This goes well with a Moroccan lamb tangine that I enjoy making! Thyme (Thymus praecox), is a creeping herb that has small purple flowers. It is another wonderful herb to have in your garden. I have this creeping thyme as a nice border along the edge of my front walkway. Once it takes to the soil, the thyme will spread and keep the soil from eroding. Thyme has been used not only in kitchens, but also to treat coughs, flatulence, stomach troubles, asthma, and indigestion. A homeopath would be able to tell you more how its medical qualities can be used. I find that using thyme with fish, meat, and vegetable dishes helps to make your meal flavorful. Thyme infused oils and vinegars may be used on salads. Dried thyme leaves can be added to a variety of handmade items, such as: soaps, lotions, room fresheners, and sachets. These are just a few common herbs that are easy to grow and can make your dinner even more delicious. Remember, adding lemon juice and herbs can help make a more flavorful dinner without adding tons of salt. For those with high blood pressure, this is good to know, as you probably are thinking of various ways to make your food appetizing at the same time as reducing your salt intake. I look forward to trying different herbs with all kinds of fish! Mmmmm……… yummy! De la Tour, Shatoiya. 2001. The Herbalist’s Garden. Pownal, VT: Storey Books. Holmes, Caroline. 2004. Romantic Herb Garden. New York, NY: Universe Publishing. Hartung, Tammi. 2011. Homegrown Herbs. North Adams, MA. Knapke, Debra and Laura Peters. 2008. Herb Gardening for the Midwest. Auburn, WA: Lone Pine Publishing International. McVicar, Jekka. 1995. Herbs for the Home. New York, NY: Penguin Books USA Inc.
Phillips, Roger and Nicky Foy. 1990. Herbs. New York, NY: Random House. Sturdivant, Lee. 1994. Herbs For Sale. Friday Harbor, WA: San Juan Naturals. Thorburn, Gordon. 2010. Classic Herb Garden. Barnsley, South Yorkshire, GB: Remember When. Tucker, Arthur O. and Thomas Debaggio. 2009. The Encyclopedia of Herbs. Portland, OR: Timber Press.